Ventilator/ Respirator, specially built for respiration of mice, rats and guinea pigs and general inhalation anaesthesia with an endotracheal canula. 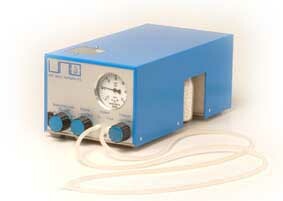 Standard the UNO ventilator is equipped with a connection for Anaesthetic gas (mixture), controlls for Frequency, volume and minimum/ maximum pressure, a "circle" system and the possibility for P.E.E.P. settings (f.i. with open thorax surgery). It is also possible to place the animal under a microscope or in a Stereotakt or waterbath because of the ± 80cm long flexible hoses and endotracheal-canula connection. The unit needs a gas supply (Air, O2 or mixture). With extended gas supply- and gas exhaust tubing - the connection of the intubation tube is projected on a flexible supply- and exhaust tubing (which is part of the "Circle" system). When setting up the UMV-03, you will need to have an artifical test lung available. For the intubation of the animal prior to connecting the UMV-03, you could use the UNO Intubation Aid.